Incorrectly listed as per usual, the image shown is a custom hole, using a drill and cutter NOT done by the pressing plant (CBS) the edges are poor and labels torn, a CBS die-cut finish would be 100% professional and also look it! Is the version of Sao Paolo on this particular 12" pressing definitely an alternate mix as well as being shorter? quality of the pressing is brilliant : it sounds 8/10 !!! This or the US promo Chic - Dance, Dance, Dance (Yowsah, Yowsah, Yowsah) are the ones to get... the sound is so crisp and punchy, the Atlantic pressing always felt so weak and less defined. Mine has a black label but I'm not seeing this on Discogs, anyone else have this one? According to Nile Rodgers in his autobiography, the Buddah Records pressing featured the mastercut recording, whereas the Altantic Records discs were pressed from a second degree tape of the original master. 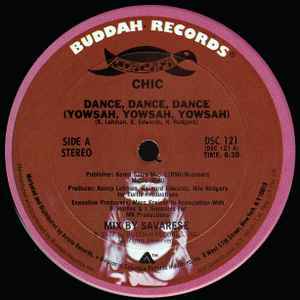 Chic were at the time of release signed to Buddah but that company were unable to press and distribute the disc in time for an important music trade event. In the end, Altantic were given the tape and the chance to press and release the song first. In a double label deal, both Buddah and Atlantic pressed and sold their versions of the song. Apparently, although Tom Savarese is credited with mixing the song, he did not in fact mix the version that appears on the release - he did mix the song, but that version was not used. Chic decided however to use his name on the disc as they knew that this would add extra kudos to the release.